So let’s get started! This fragrance contains notes of star anise and green apples (top notes), orchid, vanilla and heliotrope (heart notes), and patchouli, amber and musk (base notes). All these notes create a grown-up, sensual and feminine fragrance. The most prominent notes are anise (which smells almost like liquorice), patchouli and green apples. The combination of these notes is simply captivating – it’s dark, sweet, yet bitter, and full of life. The fragrance is beautifully rounded by the floral sweetness of orchid and vanilla-like notes. A truly stunning fragrance! In my opinion, Signature For Her by Beckham Fragrances is a great fragrance for all occasions – work, night out, holiday – you name it. 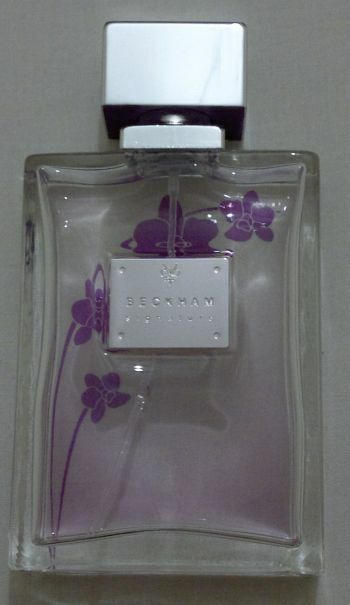 Signature For Her by Beckham Fragrances is available as 30, 50 and 75 ml Eau de Toilette spray. Prices vary from about £8 for the smallest bottle to £20 for the largest bottle. I’ve also seen stores offering this fragrance for twice as much, but thanks to drugstores and discount web sites, this elegant fragrance can be yours for very little money.